this is such a particular time in my life. strange and a little lonely and such that when sleep finally pulls me under around 4:30 the sheets are wrinkled and i'm on my side of the bed, an open jar of peanut butter on the other. it won't always be like this, and i'm sure i'll miss those kinds of nights when they've morphed and gone altogether. yes--this feeling. have you seen the 'lonely blogger' photo? 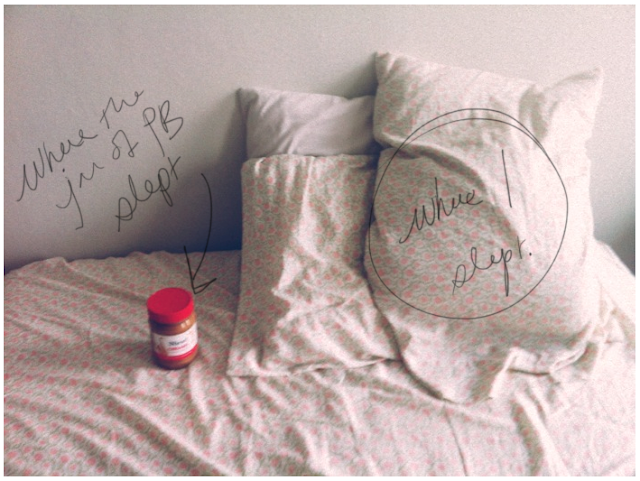 replace pb with laptop. i know both well. oh, i remember those nights. now, my one year old son is sleeping next to me! i will always remember that!!!! I know these nights all too well. been there... but with nutella... and now i have nutella in my sheets, but from my toddler... and i still don't sleep. you are so refreshingly self-aware, and you should know that it is incredibly comforting. thank you. I know this one a little too well. sigh.